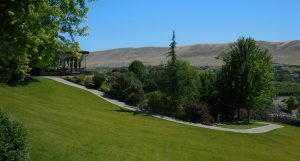 Washington has a legion of wineries producing great wine from the approximately 50,000 acres planted to vitis vinifera. Only 20 of these wineries make more than 40,000 cases annually. Small, family producers make up the vast majority of the 900+ wineries. Considering all the wines at Taste Washington’s Grand Tasting, what were the standouts for me? The three that immediately come to mind: Caideas, Cadence and Terra Blanca. All small artisan wineries. Cairdeas Winery began making wine from eastern Washington grapes in South Seattle. The family-owned artisan operation then moved to the Lake Chelan AVA, a less hectic environment to raise a family and produce great wine. Charlie and Lacey Lybecker named their winery Cairdeas, which is Irish for friendship and a nod to their Irish heritage. I would like to be their new best friend. You may want to be also. Their wines are Nellie Mae 2014 Columbia Valley White Rhone (named for his grandmother), Tri Red Yakima Valley 2014 Rhone Blend, and (being Irish and wine lover, I love this) the 2014 Caislen an Papa Meek Vineyard Red Rhone from the Yakima Valley. Caislen an Papa is Irish and, roughly translated, means the same as Chateauneuf du Pape. Chateauneuf du Pape is French for new home of the pope. History tells us there was this long line of Italian only popes and then in the 13th century, a pope was elected that was not Italian but French! He had this brilliant idea of moving the papal palace to Avignon, the heart of the southern Rhône region. There, a red wine was blended using up to13 different grape varieties, both red and white. Anyway, back to this Irish take on a red Rhône-like wine with an Irish name that so intrigued me. It’s a blend of 44 percent Grenache, 22 percent Mourvedre, 14 percent Syrah, 13 percent Cinsault and 7 percent Counoise. OK, so not the 13 allowed varieties, but when was the last time you saw Cinsault and Counoise in a Washington wine? Definitely a wine to seek out. Nellie Mae is a white Rhone blend of 70 percent Viognier and Roussanne with 14 percent alcohol. The nose is fragrant, the flavors are balanced and the finish is long. The 2014 Tri was a blend of Yakima Syrah (64 percent) Mourvedre and Grenache with all kinds of raspberry and earthiness in the nose and on the palate. It was gorgeous. Next was Cadence Winery and the charming Ben Smith. 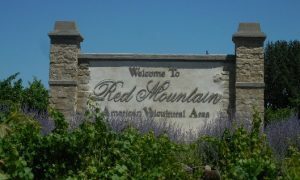 I love their Red Mountain sourced wines. All of these wines will draw you in, as they drew me in, by their fragrant aromas. The Cadence Coda made by Smith is a Bordeaux blend-like wine of Cab Franc (46 percent), Merlot (28 percent), Cab (17 percent) and Petite Verdot (9 percent) from the Taptiel and Ciel du Cheval Vineyards on Red Mountain. This full-bodied blend redolent of black fruits and earth is especially nice right now but could use a year of aging to marry the flavors. The 2014 Camerata is a Bordeaux blend from Smith’s own Cara Mia vineyard on Red Mountain. It’s composed of Cab (40 percent), Merlot (34 percent), Cab Franc (15 percent), and Petite Verdot (2 percent). Winemaker Smith made me feel very special when he pulled out a Bel Canto from 2002. 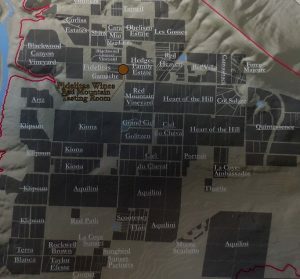 The grapes came from Taptiel Vineyard and were a blend of 49 percent Cabernet, 34 percent Merlot, 15 percent Cab Franc, and 2 percent Petite Verdot. The wine was beautiful. In 1992, Keith and ReNae Pilgrim purchased of 300 acres on an arid, treeless slope called Red Mountain. They journeyed from California to Washington to build Terra Blanca Winery and Estate Vineyards into one of the most magnificent estates on the mountain and perhaps the whole state. The winery houses a restaurant and a separate banquet room with view of the estate well-manicured grounds. The gigantic underground cellar keeps the barrels and bottles cool. At the Taste of Washington, they were pouring the 2013 Estate vineyard ONYX, a Bordeaux blend; the 2013 Signature Series Block B Syrah, also from the estate vineyards; and the Signature Series Estate Vineyards 2012 Titan Red. The 2013 Signature Series Block B Syrah was gorgeous. Rich and polished, it had black raspberry white pepper and smoky herbs. The complexity of it! Another rich and polished wine is the ONYX, which always lives up to high standards. This dense red has flavors of black cherry, plum and aromatic spices neatly framed by silky tannins that will age beautifully for a few years. Looking through my notes, I saw a couple more you must check out because they are outstanding, too. New Red Mountain arrival Canvasback is a property of California’s Duckhorn Winery. This 2014 Cab is from Ciel du Cheval Vineyards while they wait for their 20 acres of estate vineyards, planted in 2011, to come to maturity. This wine is a blend of 87 percent Cab, 9 percent Merlot, and a dollop of Cab Franc and Malbec. Get some of this beautiful wine. At Bartholomew Winery, a Seattle urban winery on Airport Way South, you can taste the unexpected. These unusual wines are made from some rare grape varieties in this state. Their wines — Carménère Rosé and Konnowac Vineyard Tannat — are sourced from the Rattlesnake Hills AVA. They also produce a Horse Heaven Hills Primitivo. Carménère is rarely seen in Bordeaux, where it was born. It’s more likely to be found in Chile where for years, it was mistaken for Merlot. Tannat is a thick-skinned varietal most famous as the principal grape in a Madiran and now coming into its own again in South America’s Uruguay. All these wines are deftly made by owner and winemaker Bart Fawbush. There are more, so many more small, artisan wineries to discover in our state. Cheers to the continued adventure!